Imagine ordinary Thursday night at home – around 1.30 a.m. you are sitting on your favorite sofa with a cup of tea (or maybe a glass of wine) looking through some stuff in online stores and add products you like to your shopping cart. Then you might get doubtful, distracted or sleepy and go straight to bed, forgetting about your online shopping the next morning. The situation like this happens a lot (the average abandonment rate in the sales sector is over 73%) That is why for many sellers the question is how to remind their customers about abandoned carts without getting too pushy and annoying. Abandoned cart email is a must for all the online sellers – according to some studies 69% of customers admit that cart reminders either made them complete their purchase of somehow influenced their decision even if they were a little annoyed. Obviously, it is crucial for any marketing activity to be helpful, not annoying, so you’ll have to find useful tools to help you send the right emails to the right people at the right time. For most people (your personal experience and most surveys prove it) sale, coupon or free shipping would be enough to check out. Many buyers won’t complete the purchase because of the shipping cost they were not ready for while looking through your products or because they decided that the item they liked is too pricey. So, it might be a good idea to simply remind about the abandoned cart in the first e-mail, but offer free shipping or inform about sales next time you contact your customer. We all get so many e-mails and get so tired from all the reading, answering and deleting. Try to make your client’s experience with cart reminder as pleasant as possible – avoid being too formal and boring and be funny if it is appropriate. The greatest company e-mail is the one that makes you smile and feel better. Use humor, self-irony and thoughtful message to stand out from hundreds of other e-mails. And remember that your clients as all people appreciate caring and hate pushing. You can’t be too attentive to the details when it comes to e-commerce and your customers. Try to imagine every possible situation – your buyer will probably read your e-mail from a mobile device while being busy with something else. That is why all the links should lead directly where they supposed to, everything has to work from any device as easy and smoothly and fast as possible. If (and this is not rare) the link in the abandoned cart e-mail leads to an empty cart you will annoy and most likely lose your customers. And honestly, who would blame them. You would be surprised on the percentage of buyers who never check out because of the questions they have and no way to reach the seller and ask all of them. Seriously, for many people, it is crucially important to learn everything about the return policy, possible sizes and colors, ways of shipping and many other details. You can have your own experiment: leave an actual contact information in your next abandoned cart email and see how many people didn’t complete the purchase because they needed more information. You will probably enjoy the number of the following check outs as well. 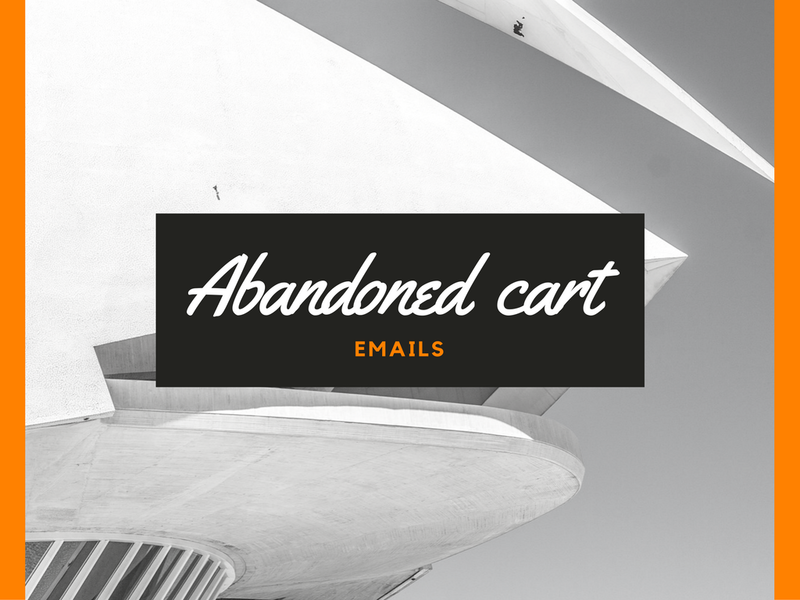 As you can see abandoned cart email can be an effective way to increase sales, but only if you do it wisely – with proper tools, strategy, and care.